In a climate of continuous network evolution, Distribution Network philosophy is changing around the world. The impacts of complex power flow, distributed renewables and customer expectations of reliability are causing a significant change in the policies and procedures that Distribution Network Service Providers (DNSPs) have deployed for effective network operation. Traditional network models of maintaining key protection assets within the substation and leaving only sectionalisers and load break switches outside the substation fence is losing appeal, as the nature of distributed energy resources requires intelligence to be closer to the customer. Protection and Control outside of the substation is no less important than the core protection of the system. Distributed intelligent assets such as Automatic Circuit Reclosers are becoming more commonplace, providing increased reliability on feeders and removing the need for the supply discontinuities that traditional sectionalisers require. With the convergence of price between these two classes of distribution asset, there comes a requirement to shift works practices. Sectionalisers are typically automatic switch devices which lack the capacity to interrupt fault current. Their design is to sense fault passage, then open upon upstream circuit breaker operation. This provides isolation of the faulted feeder segment, but at the cost of taking the entire feeder offline. Automatic Circuit Reclosers are also automatic devices, but belong to the switchgear class of Circuit Breakers, providing fault interruption capacity throughout the network. Their protection grading is set to act before the substation, allowing the Recloser to increase reliability on the feeder through limiting the impact of fault outages. 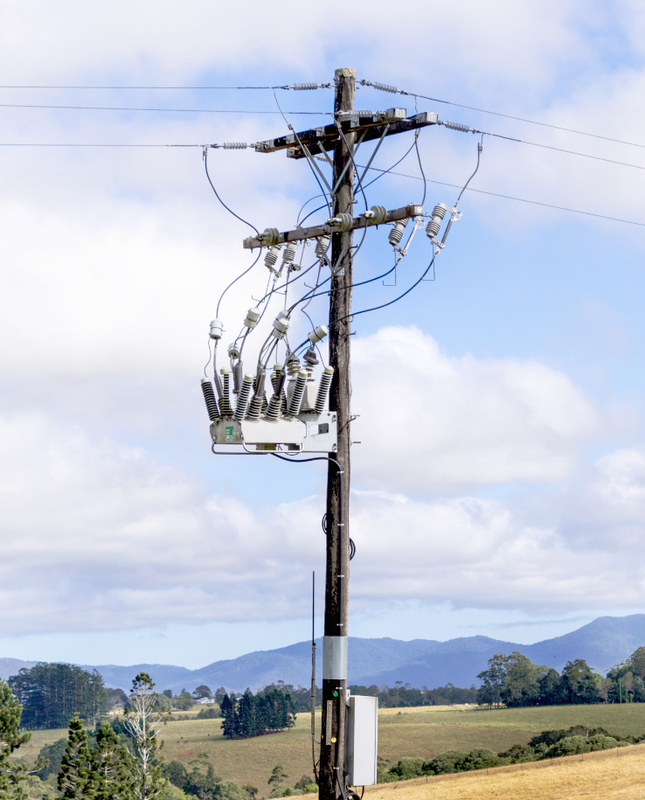 There are two main reasons that Sectionalisers and Load Break Switches remain in use on distribution grids, but these motivations are quickly eroding and throughout North American, UK and the Australia Pacific region, the transition has already been made. These reasons are Capital Expenditure, and Working Point of Isolation. Capital expenditure is simple, Reclosers traditionally commanded a price premium over equivalent remote controlled sectionalisers, but modern manufacturing techniques has eroded this difference such that the price is effectively equal. With the Capital expenditure issue mitigated, the remaining issue is a Working Point of Isolation. Modern Reclosers typically deploy Vacuum Interrupters as their core operating technology. This allows for significant fault interruption capacity in a very small operating space. However, Vacuum Interrupters are not rated as isolation points as their Basic Insulation Level (BIL) is below requirements for Working Point of Isolation. During normal protection operation this is of no consequence, but for the purposes of line maintenance and physical contact with the equipment, a greater isolation is required. The solution is remarkably simple and is widely deployed as works practice through nations with distributed protection assets. To add a working point of isolation to a Recloser installation, the answer is as simple as adding a set of off-load disconnectors. These commodotised devices are a fraction of the installation cost, and provide the required isolation point for any field work. When an operator needs to conduct work on the line, the Recloser is opened, either locally or remotely. The operator then uses a HV operating pole to open the isolators whilst off-load, providing a visible point of isolation. The Reclosers’ onboard sensors provide additional assurance of the state of the network, allowing operators to view the voltage on the isolated side of the device, verifying the safety of the lines for operation. NOJA Power’s OSM Reclosers have been deployed in 87 countries around the world. The advanced onboard sensors and unrivalled protection capabilities make the units an easy solution for Renewable connection, network reliability or simply feeder protection and automation. To find out more, visit www.nojapower.com.au or contact your local NOJA Power Distributor.